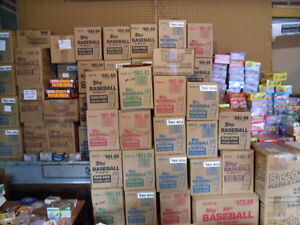 Details about Gigantic Estate Sale Of Old Baseball Card Packs Plus One FREE Mantle Card! FANTASTIC GIFTS FOR ALL AGES! TONS OF FREE BONUSES! Gigantic Estate Sale Of Old Baseball Card Packs Plus One FREE Mantle Card! One FREE Mickey Mantle insert card. It is possible! Others do, I don't! Griffey, Jr. Chipper Jones, Frank Thomas, Bonds, Larkin, Alomar, Biggio, Nolan Ryan, Cal Ripken, Ryne Sandberg, Derek Jeter, Pete Rose, and hundreds more! There are 2,751 items available. Please enter a number less than or equal to 2,751.